Here's some interesting information on the generations in Te's pedigree!!! Tesign was a 15'2 hand sorrel stallion by Design By Money, HYPP N/N. He was a 3/4 brother to Tesigned (1994 World Champion stallion and Congress Grand Champion). 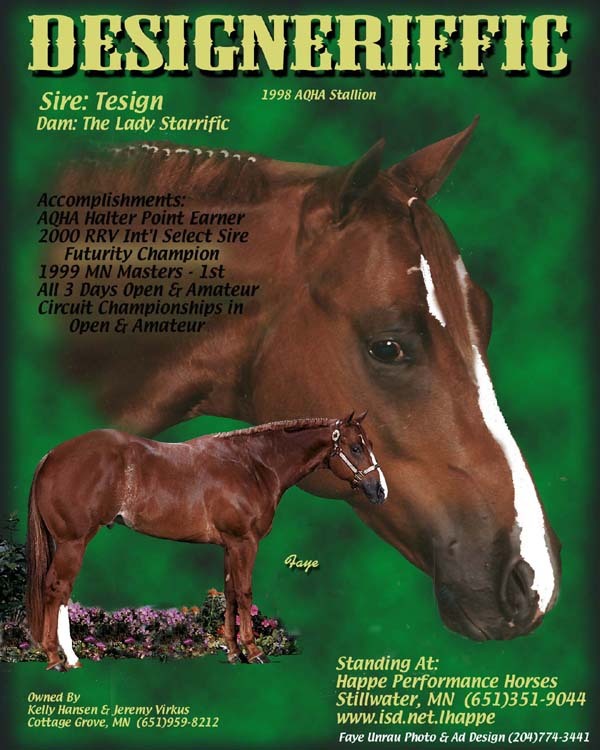 His dam, Tootsie Go Te, was unshown, but to date has produced 10 foals, included Fivestar Masterpiece who was is the 2006 PHBA World Champion Amateur & Open Aged Stallion and the 2004 PHBA World Champion Superior Amateur Halter Stallion, 2004 PHBA High Point Honor Roll 3 yr old Stallion, 2004 Honor Roll 2nd Open - 1st Amateur, 2004 Dixie National PHBA Grand Champion Stallion Open & Amateur and has 95 PHBA Color Points. She also produced Sierras Tootsies Pop who produced Five Stars My Pop - 10 TIME World Champion. She is a point producing mare in both AQHA & PHBA. His maternal grand dam, Tootsie Roll Pine has 469 halter and 61 performance points. She was sired by Pine Delrio Hygro. Tootsie Roll Pine also was the 1981 Youth World Champion aged mare. His maternal grand sire, Sonny Go Te, need we say more. The list goes on and on. His heritage will go on, but he is missed here. Te has produced winners of the North Dakota Quarter Horse Association Breeders Futurity and the Red River Valley International Select Sire Futurity. In fact some of those offspring were first under all three judges and/or first under each judge at three day shows. Mind you that these offspring were all HYPP N/N. Here is just one of Te's foals!!!! Desi was raised on Etherton Farms and was successful in halter, winning the Minnesota Masters and also being shown in amateur and open with his owner going grand. Now Desi is proving to be a sire with a MN Futurity winner and MSSA Futurity tied for reserve foal!